1) When will the Opa-locka utility billing transition to Miami-Dade County? 2) Will I receive bills from Opa-locka and Miami-Dade? You will receive a Statement of Account from the City of Opa-locka for 3 to 4 months of consumption. After that, you will receive a monthly bill from Miami-Dade County. Customers will not receive two bills at once. 3) Who do I call if I have questions about my bill?
) dedicated to resolving questions related to the transition. 5) Will I have the opportunity to pay my Statement of Account from the City of Opa-locka over a period of time? Yes, we are recommending to the City Commission a payment plan to make it convenient for our residents and customers. 6) Will I receive a discount if I pay my entire balance due to the City of Opa-locka? 7) Will the City begin shutting off service? As you may know, the City of Opa-locka has been very lenient in service disconnections due to economic conditions and billing delays. We do not anticipate the disconnection of service for customers who make a good faith effort to cooperate with the City in setting up a payment plan and abiding by it. We will work with you! 8) Where can I pay my bill once the transition is made to Miami-Dade County? 9) Will I need to make an additional water and sewer deposit to Miami-Dade County? No, only new customers who open accounts once Miami-Dade County has taken over billing will have to pay a new account deposit. 10) What will happen to my current deposit with the City of Opa-locka? Your deposit is intact with the City and will be refunded to you or credited to your account upon account closure. 11) Where will I go to open, close or make changes to my account? 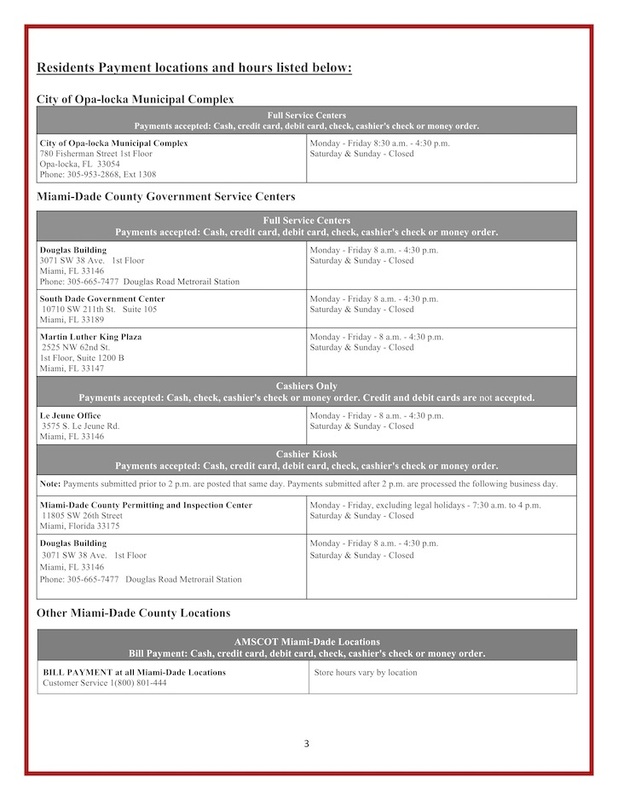 You can continue to go to Opa-locka’s City Hall and any one of the following places once Miami-Dade County begins billing. 12) Who will be handling water and sewer related emergencies once the billing transitions to Miami Dade County? The City of Opa-locka and Miami-Dade County.